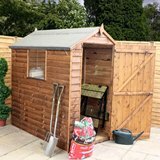 This Lean to style metal shed is a quality hot-dipped galvanised steel throughout manufactured garden shed and is substantially heavier and sturdier than all other "thin clad steel sheds" and therefore comes with a superb 10 year "no rust perforation" warranty. 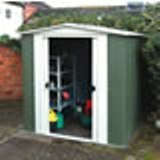 This metal shed range features ventilated gables to help prevent condensation. 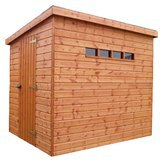 The Lean To Grandale shed has a door and roof which are fully reversible so can be assembled to whichever configuration suits your purposes.